3.1) Allow the SAP Crystal Report 2013 setup program to run. 3.2) Select SAP Crystal Reports 2013 SP01 setup language. 3.3) Check for presence of the critical prerequisites for SAP Crystal Reports 2013 SP01. 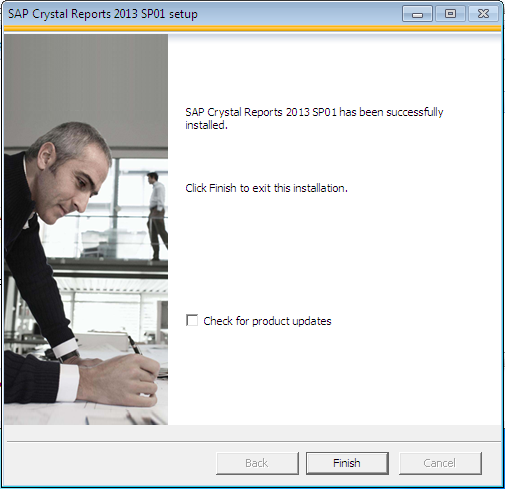 3.4) Click Next to continue with SAP Crystal Reports 2013 SP01 installation process. 3.5) Accept the License Agreement for the installation of SAP Crystal Reports 2013 SP01. 3.6) Configure the destination path for SAP Crystal Reports 2013 SP01. 3.7) Type the Product Serial Key for SAP Crystal Reports 2013 SP01. 3.8) Select the language packages for SAP Crystal Reports 2013 SP01. 3.9) Select typical components of SAP Crystal Reports 2013 SP01. 3.10) Ready to start the installation of SAP Crystal Reports 2013 SP01. sir please can you share download link ? Do you know if files from 2011 version can be opened and worked in this version of crystal reports 2013? key is only for 30 day trial!!!! cd key not working. Do you have correct one? product key for crystal report sp4 what? Your key is no good. this product key for trial version or full version? SAP Crystal Report for Enterprise 4.1 sp9 Product key can you provide me. do u have one for Crystal Report 2016?